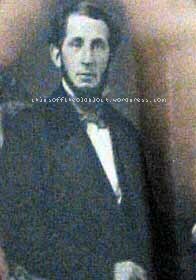 Isaac Gabriel de Guadaloupe Angus1,the eldest child of James Winans Angus and Wealthy Ann Jaques (married 26 January 1839) was born on 12 January 1840². In terms of his first name, little Isaac was likely named after Wealthy’s father, Isaac Jaques, but I have no idea where the very unusual “Gabriel de Guadaloupe” comes from. There are a number of places in Mexico with Guadalupe (alternate spelling: Guadaloupe) in their name, including an area of Mexico City, apparently. 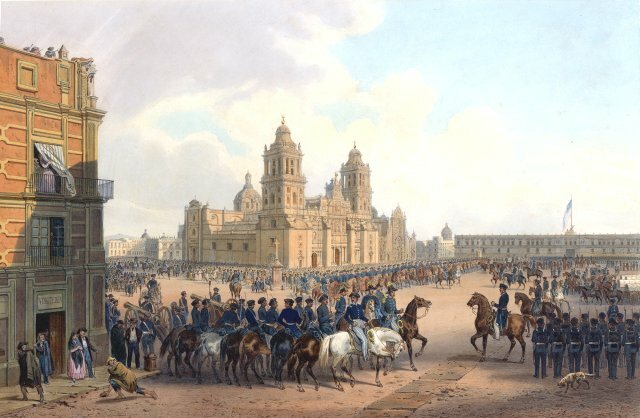 As Isaac’s birth preceded James and Wealthy’s relocation to Mexico before the Mexican-American War, perhaps Gabriel was someone they met in New Jersey or someone in Mexico with whom they corresponded who was of such great assistance to the family in making arrangements for their upcoming move to Mexico that they decided to name their first-born child after him. While it could be completely off the mark, that’s my best theory at this point. 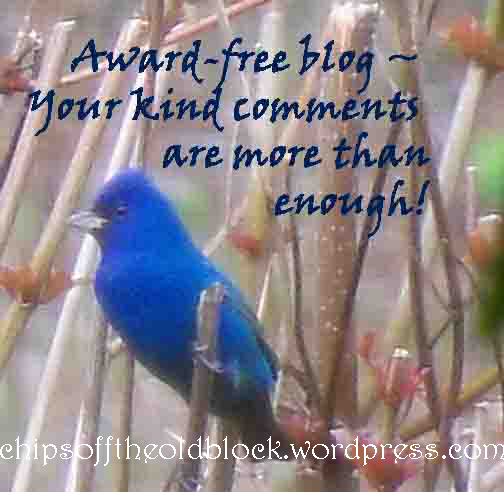 If anyone reading this has other thoughts on the matter, please chime in. 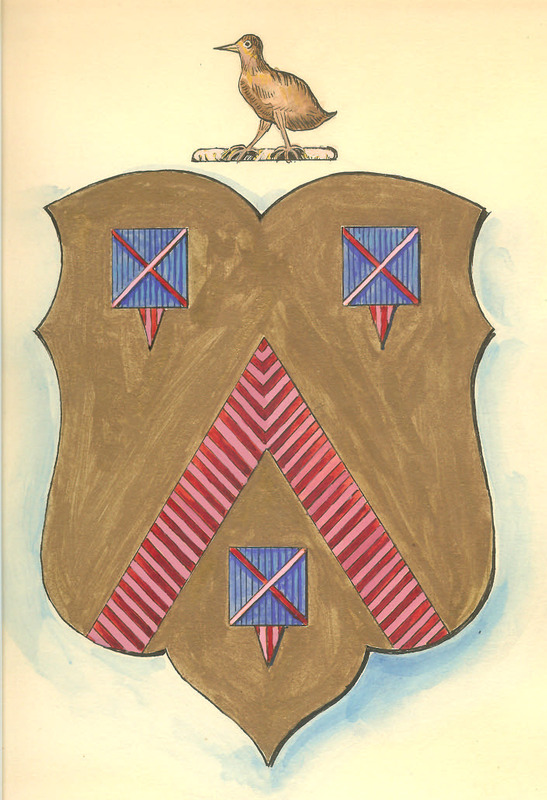 There was about a 22-year span between Isaac G. de G. Angus’s birth and the birth of James and Wealthy’s 11th, and youngest, child Walter Prince Angus. Some sources say Isaac was born in Norwich, CT, but the family Bible indicated that the birth took place in ‘Elizabeth Town, New Jersey’, and I am more inclined to believe the latter. Then, the young family moved to Norwich, where second child James was born. Some six to seven years after returning to NJ, Isaac entered Princeton University. 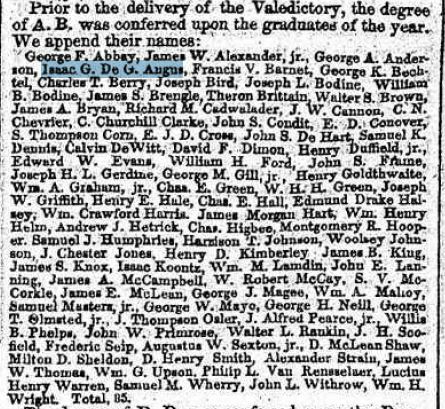 He graduated on 27 June 1860 with an AB degree5 and went on to be employed as a clerk in the Union County Surrogate’s Office, a position he held for many years6. In 1862, the Angus family’s world was shattered when James W. Angus died of erysipelas7, also known as St. Anthony’s Fire ( disease that was dreaded in the Middle Ages), a bacterial infection of the upper dermis and superficial lymphatics. I found one website that describes the disease as being caused by the consumption of ergot (a fungus that contaminates grains such as rye). It’s not usually fatal unless there are complications, so James’ case must have been particularly severe. He was only 52. Wealthy was left a widower with a very large brood of children, aged 1 – 22, to tend to. In the years ahead, her home became the anchor for some of her children (or their spouses) after losing their life partner and needing a place for themselves and their children to stay. It’s no wonder she had to slowly peel off and sell real estate holdings to keep her household going8. 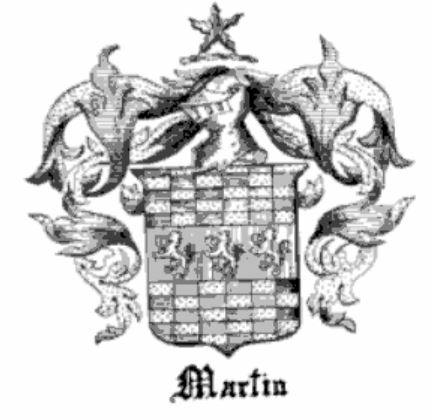 “New Jersey, County Marriages, 1682-1956,” index and images, FamilySearch (https: //familysearch.org/ark:/61903/1:1:VWR3-3R8 : accessed 17 April 2015), Isaac G Angus and Susan M Robinson, 08 Jun 1865; citing Union, New Jersey, New Jersey State Archives, Trenton; FHL microfilm 1,301,706. 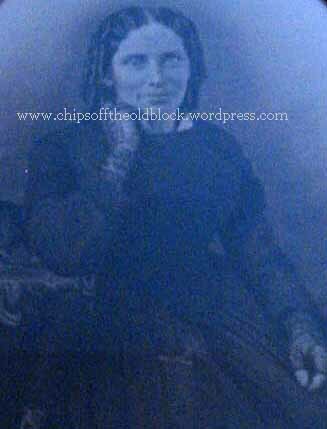 On June 8, 1865, in Elizabeth City, NJ9, Isaac married Susan Maria Robinson (b. 5 Aug 1837 in Brookfield, Worcester, MA10), the daughter of Jeremiah and Julia Robinson, who were both originally from Massachusetts. (According to the 1850 census11, Susan (age 12) and the rest of the Robinson family were living in Elizabeth, NJ. Jeremiah was listed as a merchant with real estate holdings valued at $6,500 (almost $192,000 in today’s currency). Among Susan’s siblings were Oscar B. Robinson and Zachary T. Robinson.) 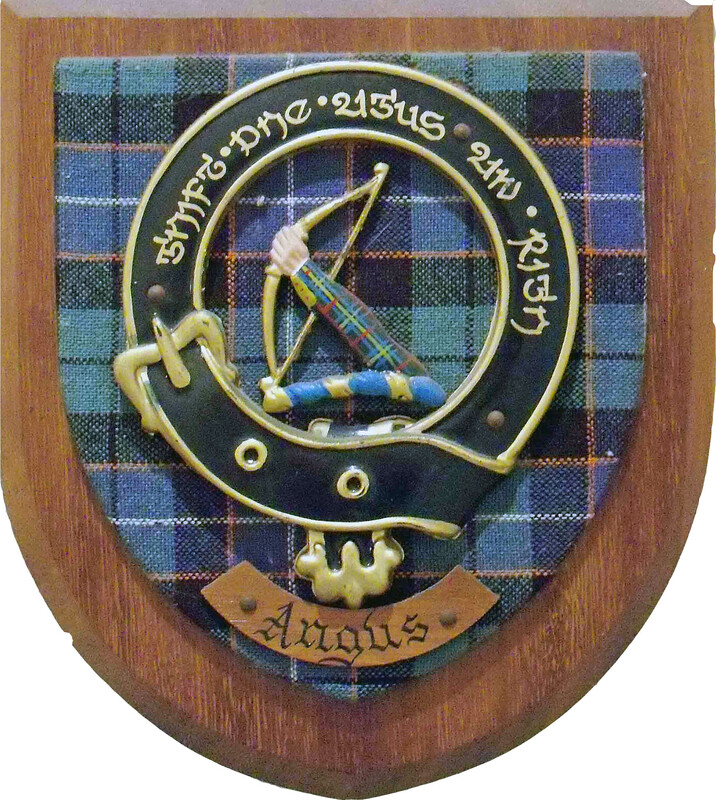 A first child, James W. Angus, was born to Isaac G. de. G. Angus and Susan Robinson on 22 Jun 186612. On 22 Jan 186713 (according to NJ Births and Christening Records), a male child was born, but that birth is not recorded in the family Bible, so I am not sure what to make of this record. Did this child die a short time after birth? Or was this James, and the DOB was recorded incorrectly in the Bible? The former seems more probable to me. Almost exactly nine months later, another son was born, Isaac Jaques Angus14 (30 Oct 1867)—named after his paternal grandfather. 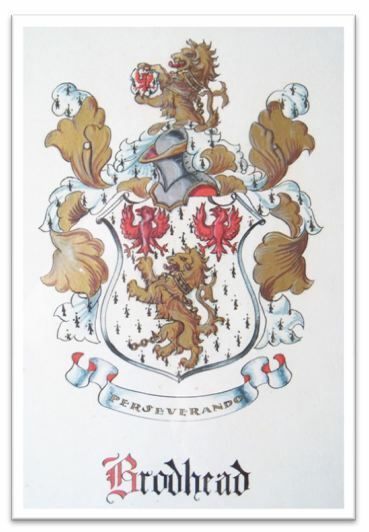 And yet another son, George Belcher Angus, was born on 5 Nov 186915, in Elizabeth, NJ. Son James, who would have been four at the time, is not present. Had he passed away? Two years passed, and tragedy struck. That summer, little Isaac died on 1 August 187217, just shy of his sixth birthday. He was followed four days later by little George, who died on 5 August 187218. It goes without saying that this must have been a devastating blow to the parents and the extended family; especially if they had indeed lost little James too. A worldwide smallpox epidemic that began in 1871 claimed eight million lives; had this been the cause of death for Isaac and George? It must have been a joyous day when Isaac and Susan’s welcomed their last child Addison Clark Angus on 17 December 187519. Addison was so young at the time of his father’s death, he may have grown up without any real recollections of him. And then at age 14, he lost Susan as well. She was 51. According to Evergreen Cemetery records, she died in February 1889 and was buried on the 25th of that month. The cause of death was given as ‘mania’. Isaac and their two little sons were disinterred from the churchyard of the First Presbyterian Church of Elizabeth and removed to Evergreen on 13 February 1890 to be buried next to Susan. I asked a Find a Grave volunteer to locate the graves for me (Plot 207, Section F), but they could not find any Angus markers in that vicinity. Addison certainly was faced with challenges in his young life, losing both parents the way he did. 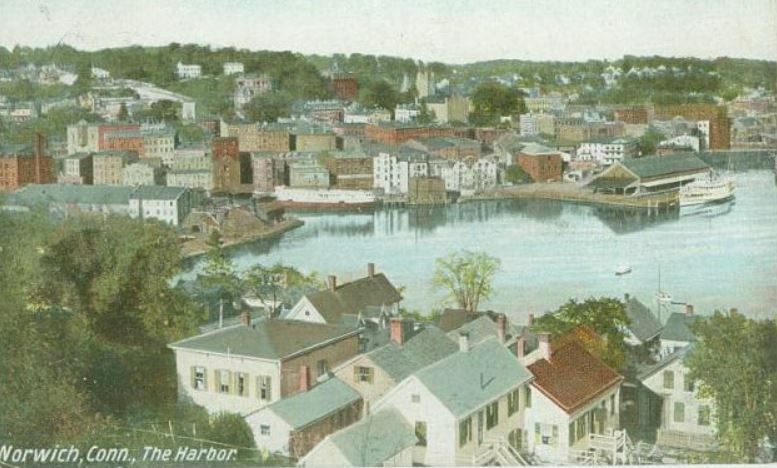 His entry in a college yearbook23 indicates he spent time in Oakham, MA—perhaps with grandparents or other relatives. He went on to attend Oberlin Academy24 in the mid-1890s and Yale25 (graduated 1901; 1913-1915, MA History), and lived a very long life. He died in 1970, having made it into his mid 90’s26. I found out a bit more information about him, including evidence of three marriages. 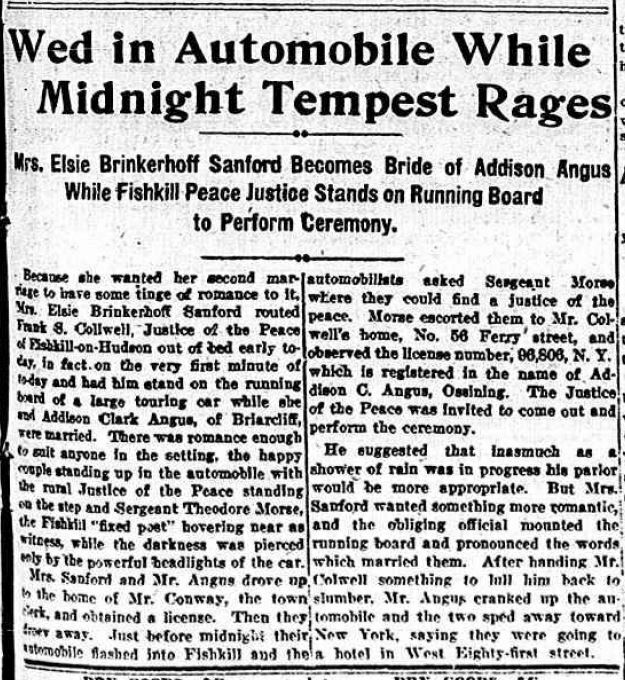 One of them, which involved a whirlwind wedding in an automobile, to a wealthy new divorcée, Mrs. Elsie Brinkerhoff Sanford (a daughter of the Fargo family—as in Wells Fargo), was quite amusing—so amusing, in fact, that the story ended up in newspapers all over the country and even halfway around the world in New Zealand!!! Some clippings are below, Each one varies slightly; clues are sprinkled throughout. 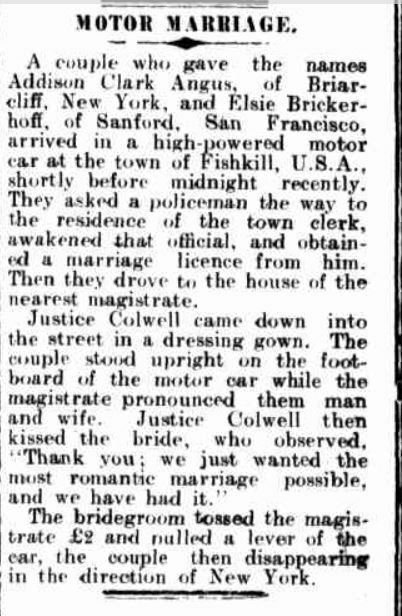 One article—in the Mathews Journal of Virginia—says the groom gave his age as 26 and the bride said she was 34, and both said they’d been married previously. Perhaps his merry mood made Addison say he was 26. Born in 1875, he would have been 37 at the time! 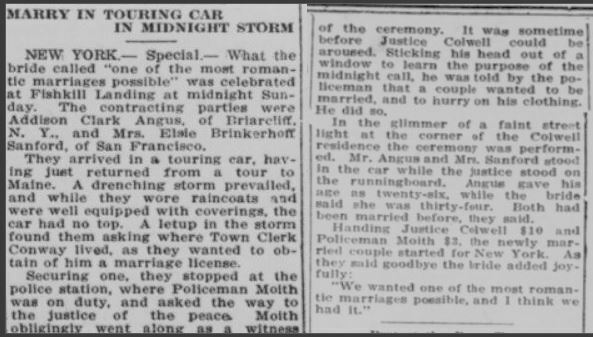 Another article said the couple had just wrapped up an auto tour of Maine and were on their way back to NYC (The Springfield Union (MA), 18 Sept. 1912; available through Genealogy Bank); Addison is buried in Maine, so perhaps that was the trip that first introduced him to the extraordinary beauty of that state. The other details I’ve discovered about Addison I will keep under my hat since they are of a more recent nature, relatively speaking. My great-grandmother Wealthy (Angus) Woodruff was one of Isaac G. de G. Angus’s little sisters; they were about 10 years apart. Their two families no doubt interacted frequently given they all lived in Elizabeth, not too far from each other. I have a few very old letters somewhere that reference Isaac’s family and will put them on my list of things to scan and share in a future post. As always, corrections, comments, additions, etc., are very welcome. San Francisco Call, Vol. 112, No. 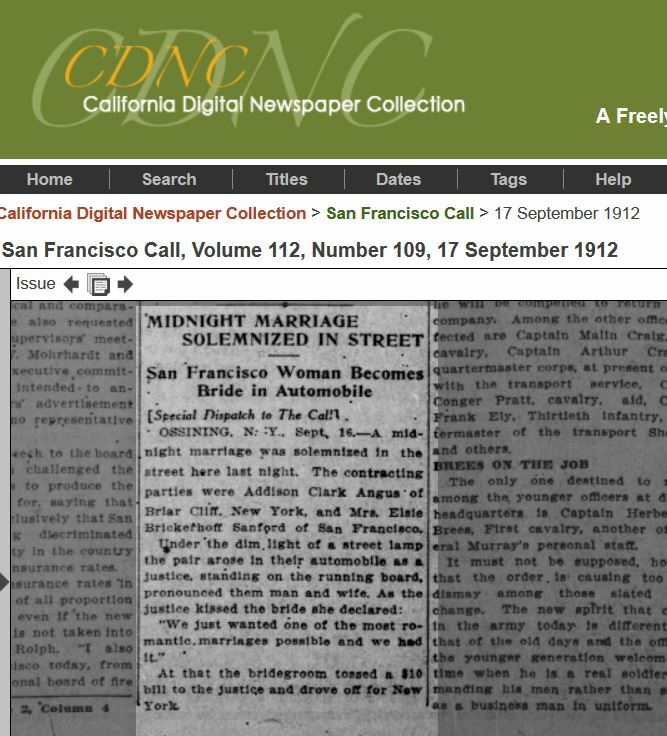 109, 17 September 1912 – California Digital Newspaper Collection – “A Freely Accessible Repository of Digitized California Newspapers from 1846 to the Present” – California Digital Newspaper Collection, Center for Bibliographic Studies and Research, University of California, Riverside, <http://cdnc.ucr.edu&gt;. All newspapers published before January 1, 1923 are in the public domain and therefore have no restrictions on use. 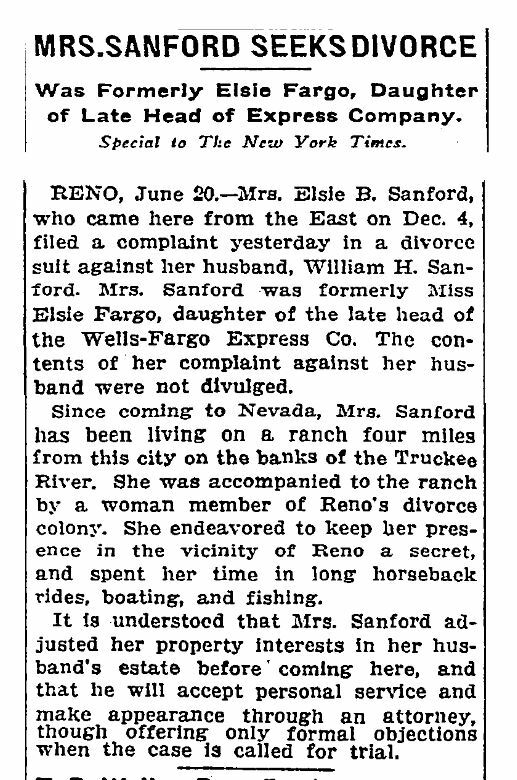 The New York Times, 21 June 1912 – Elsie was a divorcée, not a widow as one article suggests. One Line of Descendants of James Angus, 1751-1896 compiled by Harriet Stryker-Rodda and published in 1969, p. 9. “New Jersey, County Marriages, 1682-1956,” index and images, FamilySearch (https://familysearch.org/ark:/61903/1:1:VWR3-3R8 : accessed 17 April 2015), Isaac G Angus and Susan M Robinson, 08 Jun 1865; citing Union, New Jersey, New Jersey State Archives, Trenton; FHL microfilm 1,301,706. 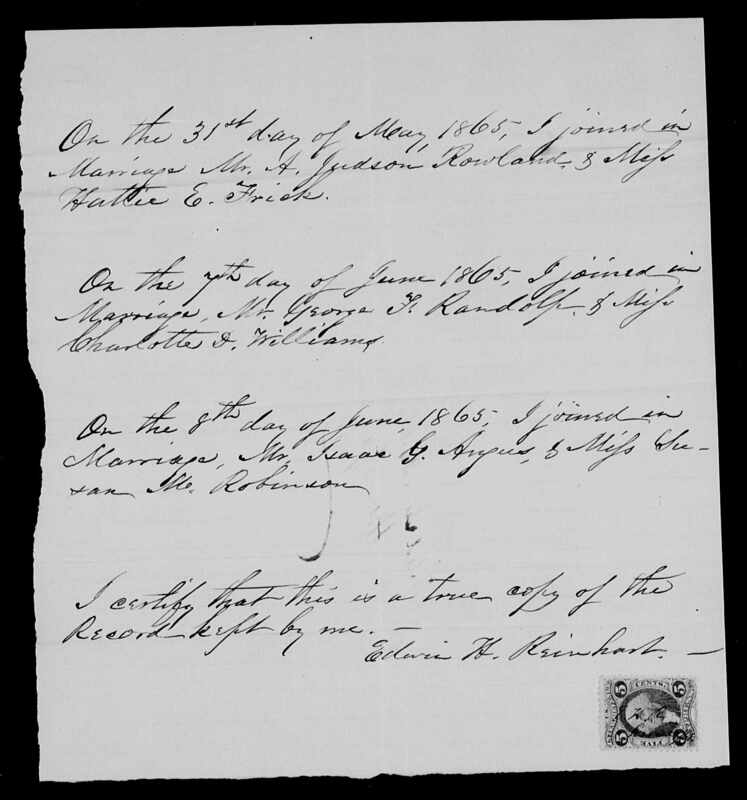 “Massachusetts, Births and Christenings, 1639-1915,” index, FamilySearch (https://familysearch.org/ark:/61903/1:1:VQ6J-CNL : accessed 17 April 2015), Susan Maria Robinson, 05 Aug 1837; citing BROOKFIELD,WORCESTER,MASSACHUSETTS, ; FHL microfilm 0547195 IT 1. “United States Census, 1850,” index and images, FamilySearch (https://familysearch.org/ark:/61903/1:1:M6MX-6P2 : accessed 17 April 2015), Susan M Robinson in household of Jeremiah Robinson, Elizabeth, Essex, New Jersey, United States; citing family 964, NARA microfilm publication M432 (Washington, D.C.: National Archives and Records Administration, n.d.). “New Jersey, Births and Christenings, 1660-1980,” index, FamilySearch (https://familysearch.org/ark:/61903/1:1:FCTD-955 : accessed 16 April 2015), Isaac Angus in entry for Angus, 22 Jan 1867; citing Elizabeth, Union, New Jersey, reference v AG p 203B; FHL microfilm 584,583. “New Jersey, Births and Christenings, 1660-1980,” index, FamilySearch (https://familysearch.org/ark:/61903/1:1:FC2X-SZR : accessed 16 April 2015), Isaac Angus in entry for Isaac J. Angus, 30 Oct 1867; citing Elizabeth, Union, New Jersey, reference v BV 2 p 998; FHL microfilm 494,163. “United States Census, 1870,” index and images, FamilySearch (https://familysearch.org/ark:/61903/1:1:MN68-PYJ : accessed 16 April 2015), Isaac Angus, New Jersey, United States; citing p. 29, family 236, NARA microfilm publication M593 (Washington D.C.: National Archives and Records Administration, n.d.); FHL microfilm 552,389. 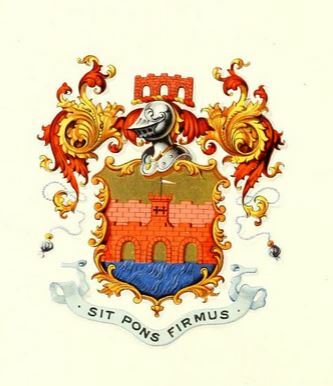 “New Jersey Deaths and Burials, 1720-1988,” index, FamilySearch (https://familysearch.org/ark:/61903/1:1:FZ8S-DX7 : accessed 16 April 2015), Isaac Angus in entry for Isaac G. Angus, 01 Aug 1872; citing Elizabeth, Union, New Jersey, reference v A-V p 319; FHL microfilm 584,595. “New Jersey Deaths and Burials, 1720-1988,” index, FamilySearch (https://familysearch.org/ark:/61903/1:1:FZ8S-DXH : accessed 16 April 2015), Isaac Angus in entry for George B. Angus0, 05 Aug 1872; citing Elizabeth, Union, New Jersey, reference v A-V p 319; FHL microfilm 584,595. “New Jersey, Births and Christenings, 1660-1980,” index, FamilySearch (https://familysearch.org/ark:/61903/1:1:FCG8-6D9 : accessed 17 April 2015), Addison C. Angus, 17 Dec 1875; citing Elizabeth, Union, New Jersey, reference v CL p 461; FHL microfilm 494,180. “United States Census, 1880,” index and images, FamilySearch (https://familysearch.org/ark:/61903/1:1:MNDS-VLF : accessed 17 April 2015), Adison Angus in household of Isaac G Angus, Elizabeth, Union, New Jersey, United States; citing enumeration district 167, sheet 114A, NARA microfilm publication T9 (Washington D.C.: National Archives and Records Administration, n.d.), roll 0800; FHL microfilm 1,254,800. “New Jersey, State Census, 1885,” index, FamilySearch (https://familysearch.org/ark:/61903/1:1:6BFT-JT2 : accessed 17 April 2015), Susan Angus in household of Wealthy Angus, Elizabeth, Ward 03, Union, New Jersey; citing p. , Department of State, Trenton; FHL microfilm . The 1901 entry for him in the Yale yearbook reads: ADDISON CLARK ANGUS ‘Agnes’ – ‘Began his career at Elizabeth, N.J. The record of his life has been carelessly kept, for he does not know when he was born nor his father’s name and occupation. He does know, however, that he himself has lived not only in Elizabeth but also in Oakham, Mass., and that his paternal ancestor graduated from Princeton in ’63. We guess that the date of his birth was …. and have ascertained that his father, …. 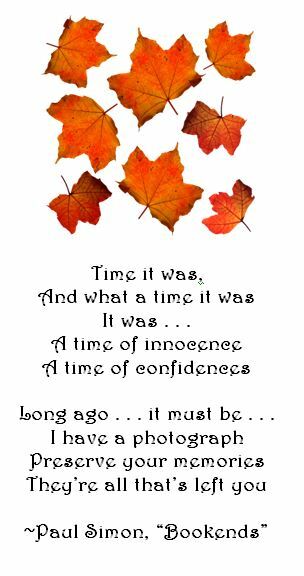 is a …. Prepared at Oberlin Academy, Oberlin, O. 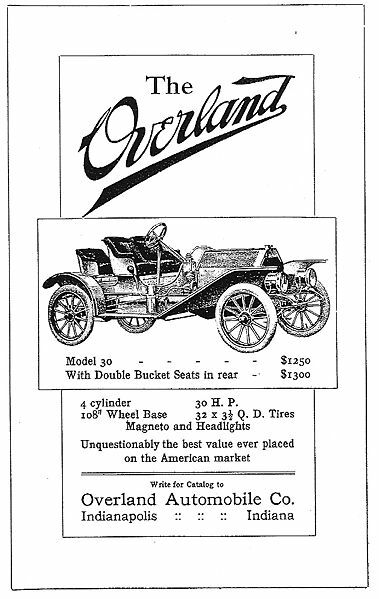 Source: ‘Cl.’ in Catalogue of Oberlin College for the year 1896. “United States Census, 1900,” index and images, FamilySearch (https://familysearch.org/pal:/MM9.1.1/M97Q-LBW : accessed 14 Dec 2013), Addison Angus, Yale University Ward 1, New Haven, Connecticut, United States; citing sheet , family , NARA microfilm publication T623, FHL microfilm 1240144.